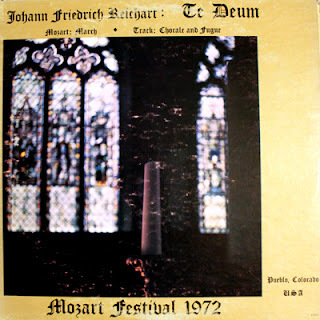 Overture and "Te Deum Landamus"
Performed on January 23, 1972, Memorial Hall, Pueblo. The festival, which was started in Pueblo in 1971 by former Pueblo Symphony director Gerhard Track, returned the following year with a performance of "Te Deum," by Johann Friedrich Reichart (1752-1814). The concert featured a 300 voice choir, made up of high school students from Crowley (Ordway), Fountain, Lamar, Las Animas, Lake County (Leadville), La Junta and Rye. The Pueblo Youth Symphony accompanied the performance.